Sonam Kapoor has hand-picked a picture featuring her father Anil Kapoor, presumably from the sets of Mubarakan, his new film, and shared it on Tuesday. Fans are delighted, we tell you. To top it all, the 32-year-old actress also has the sweetest caption for the photograph, which stars the senior Kapoor as Kartar Singh - his character from Mubarakan. The picture reveals yet another detail about Anil Kapoor - the 60-year-old actor loves to satisfy his sweet tooth with ice cream (well, that would absolutely be all of us), weather no bar. 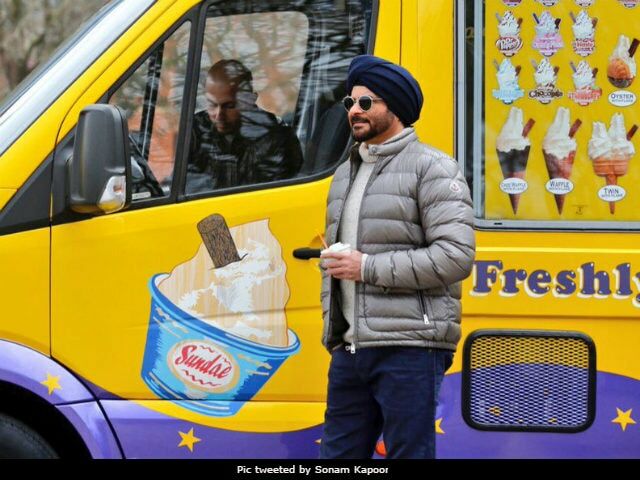 The photo which Sonam shared shows Mr Kapoor standing by an ice cream van with a cup of Sundae - meanwhile, you will get an idea of how cold it is with a look at Mr Kapoor's wardrobe. And, "It's never too cold for ice cream," says Sonam. So true. This appears to be Anil Kapoor from London, where most of the film has been shot. Meanwhile, Sonam is on another part of the atlas, holidaying with her rumoured boyfriend Anand Ahuja in New York. But no complaints Sonam, because she keeps her holiday feed updated on Instagram. Birthday boy with his new bike.. thank you for helping us out @nigelsylvester ! @anandahuja was like a kid in a candy shop! Anil Kapoor often references his children - actress Sonam, filmmaker and stylist Rhea, and one-film-old Harshvardhan in his interviews. Talking about Sonam, he recently told IANS: "She is a special child, she is beautiful not just appearance-wise, but her heart too. Her philanthropic work, her giving nature... she is a blessing... and here you caught the emotional father." Anil Kapoor's Mubarakan also features another actor from the Kapoor khandaan. Arjun Kapoor has been cast in dual roles in the Anees Bazmee-directed movie. Ileana D'Cruz and Athiya Shetty also join the cast. Mubarakan released on July 28 and has made Rs 26.46 crore so far. Meanwhile, Sonam Kapoor has films like Akshay Kumar's Padman and her sister Rhea's Veere Di Wedding to look forward to. 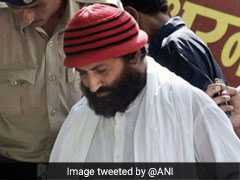 She has also been cast in the Rajkumar Hirani-directed Sanjay Dutt biopic.